The inspiration for a latex designer, painter, video artist, for pretty much anybody who makes anything, can come from a wide variety of sources. Sometimes we are not even aware of who might have influenced us, other times; pieces are made to pay homage to a source specifically. At other times, one might agree with some idea from an artist or a movement and not another. In the mix of what Dawnamatrix draws from for our wardrobe designing undoubtedly some particle, big or small, has been taken, or at least considered, from the famous Bauhaus movement. 2019 marks the 100th anniversary of this art movement that began in Weimar, Germany, in 1919. 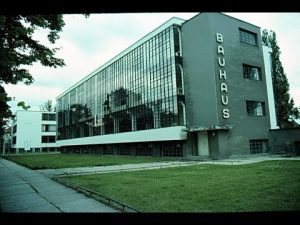 Started by Architect Walter Gropius Bauhaus only truly operated for just 14 years before it was shut down by the National Socialist Party; old Adolf and his boys would have none of it! Despite the obvious Nazi blight on the historical and cultural landscape, Bauhaus survived to become one of the most influential art and design schools in history. The movement set to bridge the gap between crafts and fine arts, combining the two for the first time with the assertion that fine art creation should reflect the new period of mass production born after WWI, fed by the era of the machine. The word Bauhaus, an inversion of the German term hausbau, translates to, “building house.” The movement’s ethos of “truth to materials” presses that all material should be used in its most “honest form” form, its nature never changed. Certainly striving to be honest in all the alternative couture we create, the Bauhaus ideals are not lost on us. For the school’s 100th anniversary year, there are various gallery and museum exhibitions planned across the globe. The Tate Modern in the UK and the Museum Boijmans van Beuningen are just two hosting special tributes.